A full-featured, standard keyboard. All keys 1-inch square, 97 character set/60 keys. 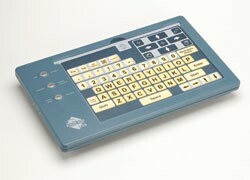 Includes all special characters on a regular keyboard, with the exception of the numeric pad. No special software required. Keyguard for BigKeys LX is included. It is clear and break resistant plastic that attaches easily to help stabilize fingers while minimizing errors. The Big Keys Plus Keyboard is a simplified enlarged keyboard with large 1" square keys. Key set provides letters, numerals, spacebar, return/enter, arrow and limited command keys. No dedicated backspace key and no function keys. We have keyboards that are color keys with black lettering. We have both Big Keys Keyboards that the keys are arranged in regular QWERTY format and alphabetized format (user-changeable onsite). Tough-built with internal steel frame. Windows PS/2 connection is standard on Big Keys Plus Keyboards. The TypeMatrix EZ-Reach is a state-of-the-art, easy-to-use keyboard. We know that adapting to this integrated, ergonomic design will be very rewarding for your health, your efficiency, and your experience of comfort while typing. 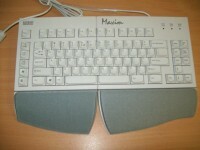 The IntelliKeys Keyboard is a versatile programmable keyboard that plugs into any Macintosh or Windows computer. It enables users with physical, visual, or cognitive disabilities to easily type, enter numbers, navigate on-screen displays, and execute menu commands. Compatible with new and old computers. Keys-U-See large print keyboards are perfect for anybody who has a hard time seeing the letters on their computer keyboards. The Key Connection's large print computer keyboards are also great for anyone working in low light conditions or is learning to type. 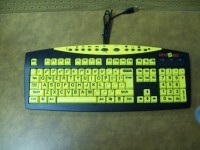 Our specialty keyboard designed with high-contrast yellow keys and black type - a scientifically proven combination that helps those with certain types of visual impairment. Much narrower and more versatile than "natural-style" keyboards. The Maxim accommodates a wide range of user preferences. The keyboard is a split keyboard with a detachable pivot tether and an 8" or 20" cord attaching the two halves of the keyboard; the cord allows separation of the two halves to better fit individual shoulder widths. 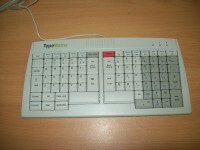 This keyboard is able to use the Microsoft "combo" USB/PS2 technology. 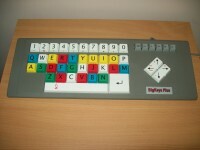 Large keyboard with oversized keys (1“) and large, bold, easy-to-read numbers and letters is helpful for people with vision or motor skill impairment. Also an excellent choice for a first keyboard for anyone learning to key, to help learn the alphabet and identify character sets with color-coded vowels, consonants, numbers, and punctuation marks. Also features two USB ports and oval F-keys. Compatible with Windows and Mac. 19" x 1.5" x 7".